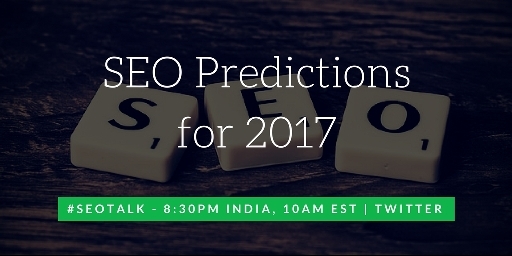 We had an exciting 2016 on SEOTalk and it was fitting to end it on a high with all the possible SEO Predictions for 2017. Over 2016, we saw a lot of action in the search industry and it kept the practitioners literally on their toes. And 2017 doesn’t seem to be any different. We are already seeing the world where desktop is being relegated to second screen and mobile devices are becoming primary. Add to that, the power of local information and contextual information. So we saw in 2016, Google increasingly giving precedence to mobile and Local SEO. That should continue to improve in 2017 too. So very aptly, we started the SEOTalk Twitter Chat with that topic and then discussed few others.Post that we moved to automation and AI in SEO. 2016 saw introduction of RankBrain and we expect it to grow bigger and beyond search queries in 2017. So search practitioners should have a field day optimizing content for AI. And finally, we moved to the importance of schemas. I had covered that topic in couple of recent meets and was surprised to see many brands still not leveraging the power of schemas. While schemas do offer better view in SERP there was another argument – it reduces CTR. The point that was being made is, since enough information is available in SERP, people wouldn’t click on the links and go to site. What are your thoughts? So off you go. Catch the chat transcripts below. This is what the community believes will happen in 2017. What are you SEO Predictions for 2017? How will Automation and AI transform SEO? Do share your thoughts over comments below.